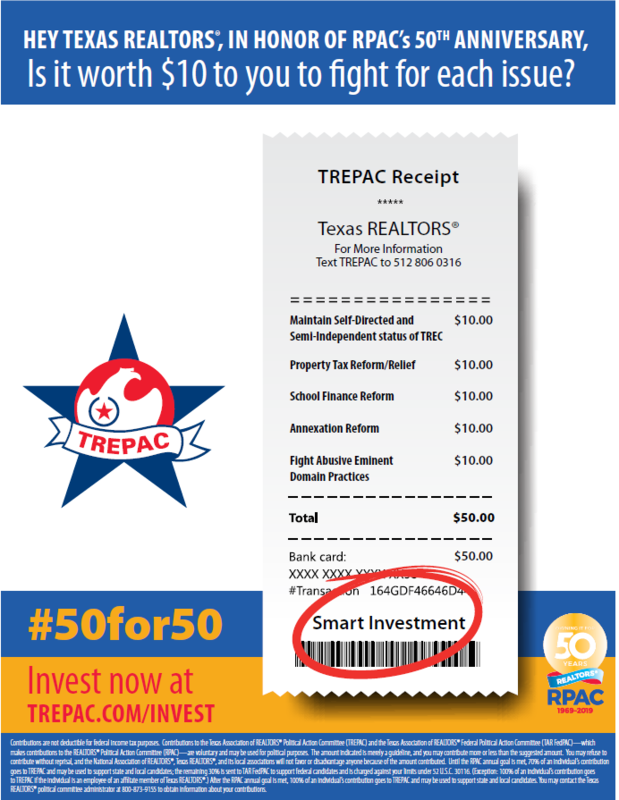 51% of all Texas REALTORS® worked hard to protect your business by investing in TREPAC last year. Don’t let them carry that burden alone. By investing in TREPAC we are investing in the candidates who will make the rules that govern how we do business. Click here to see how TREPAC Investments are protecting your bottom line. 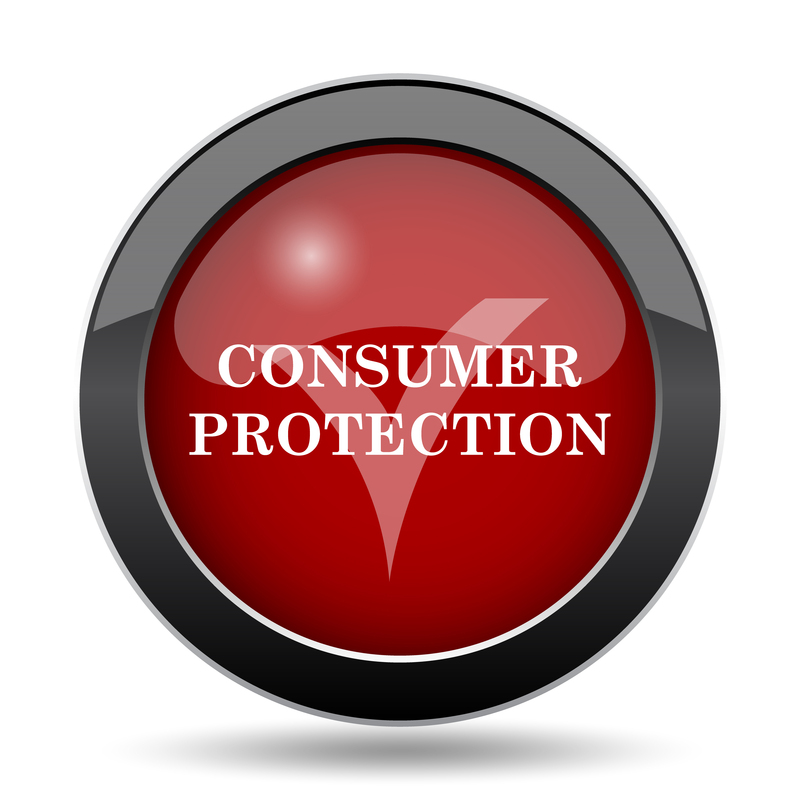 Helped enact critical consumer-protection laws in the property-tax lending industry. Supported a constitutional ban on any tax on real estate transfers and a $10,000 increase of the homestead exemption. Supported legislation prohibiting cities from imposing fees on all new residential and commercial construction. The power of the PAC is strong…but we need your continued support. 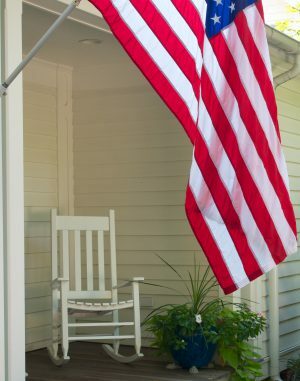 TREPAC supports candidates who support private-property rights, encourage homeownership, and support a strong real estate industry. Your support of TREPAC ensures the real estate industry is at the table, not on the menu. Everything is possible with TREPAC! Bringing YOU the most up-to-date information on TREPAC! 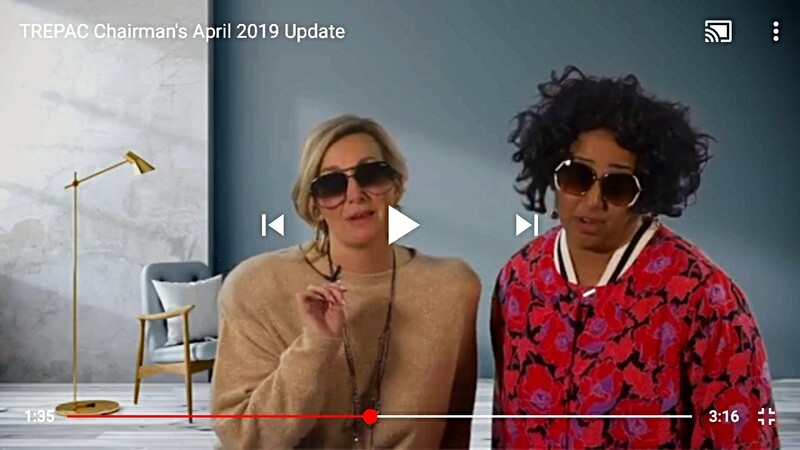 Texas REALTORS® Legislative ResourcesAs of 9 a.m. onFriday, April 19, Texas REALTORS® is following 2,779 of 7,749 bills and resolutions filed. Subscribe to Legislative Liaison weekly newsletter at texasrealestate.com/liaison—just check the box to receive updates on legislative and political affairs from Texas REALTORS®. Property Tax ReformTexas REALTORS® Chairman Tray Bates testified in support of both SB 2 and HB 2 in committee early in session.HB 2 by Chairman Dustin Burrows and SB 2 by Chairman Paul Bettencourt would enhance transparency in the property tax system and provide voters a voice when local governments set the tax rates that determine Texans’ property tax bills. SB 2 and HB 2 also address lowering the rollback rate and eliminates petition requirements for rollback elections, making them automatic. The Senate passed SB 2 on Monday and the bill is now awaiting a hearing in the House Ways & Means Committee.The House is expected to consider HB 2 on Wednesday, April 24. $9 billion would address school finance reform ($6 billion) and property tax relief ($3 billion). TREC SunsetTexas REALTORS® supports legislation that would continue the Texas Real Estate Commission after the TREC’s review by the Sunset Review Commission. These bills are SB 624 by Sen. Robert Nichols and HB 1675 by Rep. Senfronia Thompson.SB 624 was passed out of the House Licensing and Administrative Procedures Committee this week. HB 1674 was also heard by this committee and is pending.Both bills continue TREC’s functions for six years and require additional reporting to the Legislature, Governor, and Sunset Advisory Commission. TREC Appointees Gov. Abbott announced in March the appointment of our own TREPAC Trustee Alumnus Scott Kesner to the Texas Real Estate Commission.Kesner went before the Senate Nominations Committee on April 11 for a brief introduction and hearing. He’ll next move to the full Senate for approval. Home EquityREALTOR®-supported HB 1254 by Rep. Jim Murphy and SB 474 by Sen. Kelly Hancock would allow a property owner to use agricultural land as collateral for a home equity loan.HB 1254 passed the Senate Property Tax Committee and has been recommended for the Senate’s Local and Uncontested Calendar. SB 474 was heard in the Senate Property Tax Committee in March, and committee action is still pending.In 2017, voters approved a REALTOR®-supported constitutional amendment (Prop 2) to modernize the home equity lending process for property owners.This legislation would further update those provisions to allow more homeowners to access the hard-earned equity in their homes while maintaining the strong consumer protections in the Texas Constitution. Ending Forced AnnexationSeveral bills have been filed to end forced municipal annexation statewide. REALTOR®-supported HB 347 by Rep. Phil King is the furthest along. HB 347 has passed the House and been referred to the Senate State Affairs Committee, where it awaits a hearing. Disaster ResponseTexas REALTORS® supports the development and implementation of a broad range of projects to address flood mitigation and preparedness to protect all property owners. Several bills related to disaster response or relief have advanced this session. 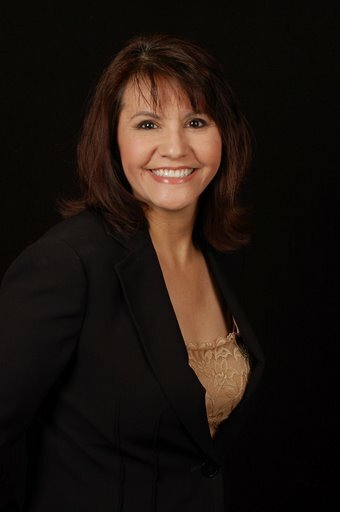 SB 6 (Sen. Lois Kolkhorst) creates a disaster response plan for local officials. The bill unanimously passed the Senate and now awaits a hearing in the House Homeland Security and Public Safety Committee. SB 7 (Sen. Brandon Creighton) creates a fund to finance flood mitigation projects. The bill unanimously passed the Senate and now awaits a hearing in the House Natural Resources Committee. SB 8 (Sen. Charles Perry) creates a statewide flood plan. The bill unanimously passed the Senate and now awaits a hearing in the House Natural Resources Committee. SB 1772/SJR 57 (Sen. Paul Bettencourt) would provide temporary property tax exemptions for damaged property. SJR 57 proposes a constitutional amendment, leaving the decision up to voters. The legislation unanimously passed the Senate and now awaits referral to a House committee. HB 5 (Rep. Dade Phelan) creates a catastrophic debris management plan and training for cities and counties. The bill unanimously passed the House and awaits a hearing in the Senate Water and Rural Affairs Committee. HB 6 (Rep. Geanie Morrison) creates a disaster recovery task force to assist with long-term recovery plans. The bill unanimously passed the House and awaits a hearing in the Senate Water and Rural Affairs Committee. HB 7 (Rep. Geanie Morrison) creates a disaster recovery plan to be enacted by state agencies as needed. The bill unanimously passed the House and will be sent to the Senate for referral to committee. HB 13/HJR 4 (Rep. Dade Phelan) creates a fund to aid in financing flood infrastructure projects. The bill unanimously passed the House and awaits a hearing in the Senate Water and Rural Affairs Committee. … and Burt’s BBQ served 90 briskets and 300+ pounds of sausage for lunch! As a reminder, 2019 marks RPAC’s 50th Anniversary. To help celebrate 50 years of fighting for real estate, we are asking everyone to bump up their Participation Club investment level to $50! May 13-18 REALTORS® Legislative MeetingsWashington, D.C.
Major Investor Events: Don’t forget, now is the time to start planning your MI Events for 2019 if you haven’t already done so. Our goal is to reach 1,196 Major Investors this year, so we can continue to have the most MIs across the country. Best practices are available here to assist you when planning your next MI event. Are you a former TREPAC Trustee and want to be more involved? An Alumni webinar has been scheduled for April 25 so look for more details in your inbox. The 2nd quarter of our TREPAC year has ended and it’s time to audit your fundraising efforts to ensure your members are being recognized appropriately! Visit the AE Dashboard to view 2019 pledge information along with your current fundraising progress. The AE Dashboard is a great tool specially designed to offer all the information AEs need to gather investment-level data and make 2019 an even better year!Contact Andrea Friedman for help or questions concerning the AE Dashboard. Submit your best TREPAC commercial by September 20 to enter the TREPAC Video Contest! Details will be coming soon, but you can start scripting and casting your video now. 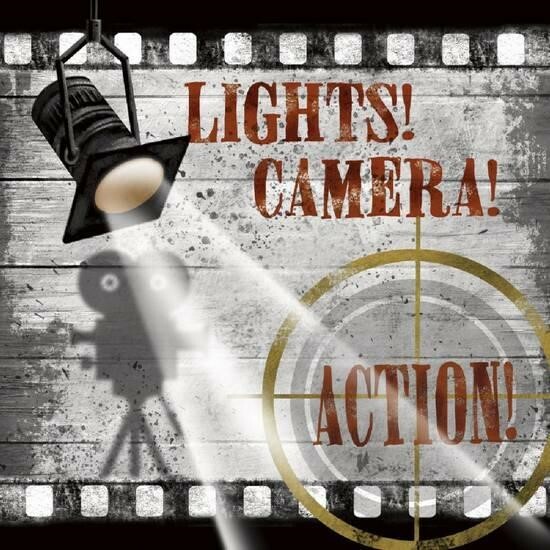 Your video will be played and voted on at TREPAC/GA Orientation in October, then posted to YouTube to help local associations promote TREPAC. So, mark your calendars now! Think you can’t throw your very own Major Investor event? Well think again. The Williamson County Association of REALTORS® hosted their very first Major Investor event earlier this month. It was an amazing success raising over $25K! Over 30 Texas REALTORS® attended this exclusive event held in the city’s historic downtown. 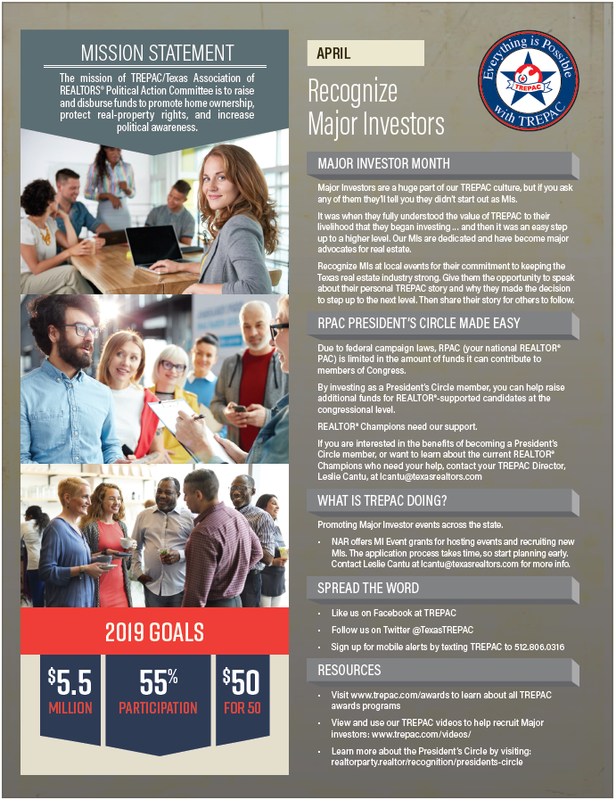 After hearing others share their story about how TREPAC has helped their business over the years, many pledged to become first-time Major Investors and President’s Circle members right on the spot! Speakers included RPAC Participation Council Chair Pam Ruggeroli; TREPAC 1st Vice Chair Tony Lloyd; Sherry Bueche and Trustee Alumni Christi Gessler and Mary Miner. If you need help getting started with your Major Investor event, remember RPAC grants are available through the Major Investor Event-Based Fundraising Program. 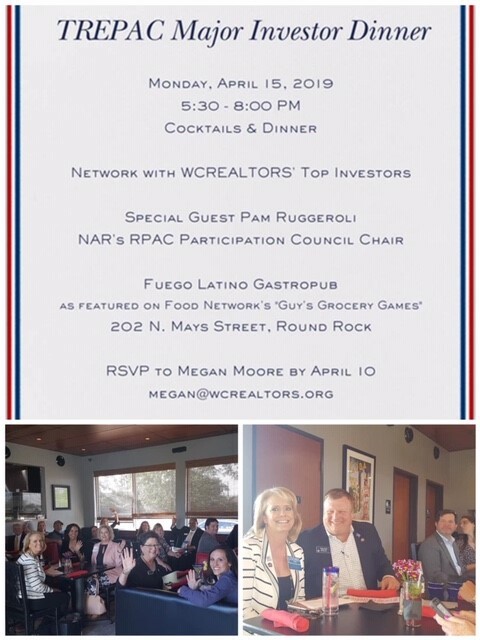 If you need help or have questions about the program, reach out to TREPAC Director Leslie Cantu lcantu@texasrealtors.com or 2019 Major Investor Council Members, Deborah Spangler deborah.spangler@yahoo.com, JoAnn Stevens jas3610@aol.com or David Alan Cox david@davidalancox.com. As of 9:30 a.m. Tuesday, March 19, Texas REALTORS® is following 2,846 of 7,505 bills and resolutions filed. Gov. Greg Abbott announced on March 12 the appointment of two Texas REALTORS® and a public member to the nine-member Texas Real Estate Commission, with terms expiring Jan. 31, 2025. Terms for the outgoing members expired Jan. 31, 2019. Read the governor’s press release here. Next, the Senate Nominations Committee will need to confirm the appointments before moving them to the full Senate for confirmation. Legislation in response to TREC’s sunset review has been filed in both chambers–SB 624 by Sen. Robert Nichols and HB 1675 by Rep. Senfronia Thompson. On March 12, the House Committee on Licensing & Administrative Procedures had its first hearing on the TREC sunset bill. Click here to watch video of the five-minute hearing–start at 25:46 to hear Chairman Charlie Geren lay out the bill on behalf of Rep. Thompson, followed immediately by Texas REALTORS® testimony in support of the legislation. The Senate Committee on Business and Commerce heard SB 624 in a hearing today, March 19. The House Public Education Committee had an all-day hearing for HB 3 on March 12 and will take up the bill again today, March 19. The Senate filed its school finance reform bill, SB 4 by Education Committee Chairman Larry Taylor. The Texas Tribune reports on the Senate’s school finance bill. Gov. Greg Abbott, Lt. Gov. Dan Patrick, and Speaker Dennis Bonnen have all made property tax reform one of their top priorities for the 86th Texas Legislature. Senate Bill 2 and House Bill 2 are legislation that would reform the property tax system and encourage more transparency and voter engagement in the process local governments use to set tax rates that determine property tax bills. Currently, the rollback rate is at 8% and voters may petition to hold an election if a local taxing entity (city, county, special district) sets a tax rate for the year that would generate 8% or more revenue than the previous year. SB 2 and HB 2—as currently written—would lower the rollback rate to 2.5% and require local taxing entities to automatically seek voter approval if they set a tax rate that would generate 2.5% more revenue over the previous year … but there’s still a lot of debate ahead for these bills. The Senate Property Tax Committee held its first meeting on February 6 and began hearing public testimony on SB 2. Texas REALTORS® Chairman Tray Bates provided testimony to the Senate committee on behalf of the association. Chairman Bates advocated for reforming the property tax system that is leading to out-of-control increases in property tax bills across the state. Click here to watch a recording of the hearing—skip ahead to 1:48:47 for Chairman Bates’ testimony. The bill requires the Comptroller’s office to develop appraisal manuals for CADs. Chairman Bates recommended that these manuals be consistent with generally accepted appraisal techniques and that a property owner be allowed to protest an appraisal that’s not performed accordingly. The bill creates special appraisal review board (ARB) panels to hear protests on complex property and allows an owner to request assignment to a special panel. The bill also authorizes the ARB chair to randomly assign other non-complex properties to the special panel. Chairman Bates recommended that this assignment only be performed with the property owner’s consent. 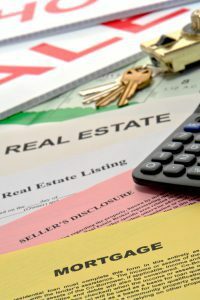 The bill provides that an ARB may not increase a property’s value above the amount on the certified roll unless requested or agreed to by the property owner. Chairman Bates recommended expanding this to apply to binding arbitration and district court hearings. On February 27, the House Ways & Means Committee held its first hearing on House Bill 2—the House’s property tax reform omnibus bill. Chairman Bates testified on behalf of the association in support of the bill and recommended the same revisions that were addressed in SB 2. Click here to watch his testimony in the House video archives—skip ahead to 03:33:55. During the House hearing, committee member Sen. Trey Martinez Fischer ask Chairman Bates about mandatory sales-price disclosure. Texas REALTORS® opposes mandatory sales-price disclosure, as Chairman Bates explained. The Texas Legislature has for years agreed and not advanced bills filed that would mandate that buyers disclose to the government how much they paid for properties. Learn more about Texas REALTORS®’ position on this issue in our Legislative Priorities for the 86th Texas Legislature at TexasRealEstate.com/issues. Ways & Means Committee members have not yet voted on HB 2 or made amendments as of March 19, so the bill still awaits committee action before moving forward. 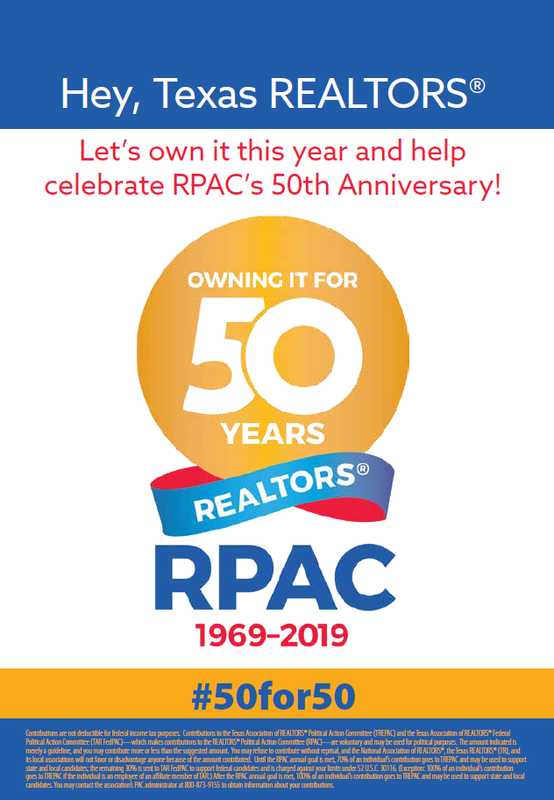 As a reminder, 2019 marks RPAC’s 50th Anniversary. To help celebrate 50 years of fighting for Real Estate, we are asking everyone to bump up their Participation Club investment level to $50! This month’s TREPAC fundraiser comes from the Lubbock Association of REALTORS®! At “Bowling for TREPAC” participants were able to compete to find out which team was the King Pin! 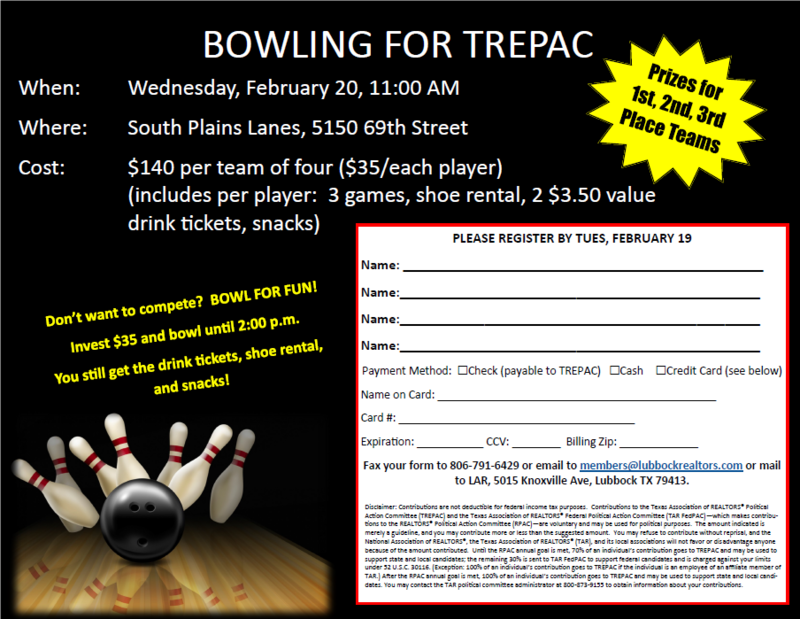 Those who didn’t want to bowl, were still able to participate at $35 and enjoy fun, food, and drinks to help raise money for TREPAC. Bowling tournaments are a great way to increase your participation with a fun event that doesn’t require a heavy lift on set up (unless you bowl with a 16 pounder)! Think about adding different ways to raise money at your own bowling tournament like a most strikes contest or team costume contest! Texas law only allows TREPAC to auction alcoholic beverages in a TREPAC silent auction if a temporary auction permit is obtained from the local Texas Alcoholic Beverage Commission (TABC) for the fundraising event. Advanced planning and close communications with Texas REALTORS® staff will be necessary in these situations. The temporary form can be found at www.texasrealestate.com > For AEs > TREPAC Resources > TREPAC Alcohol Permit. Please note: Each local TABC office requires a 10-day lead time to process applications, so please keep that in mind when completing your form. 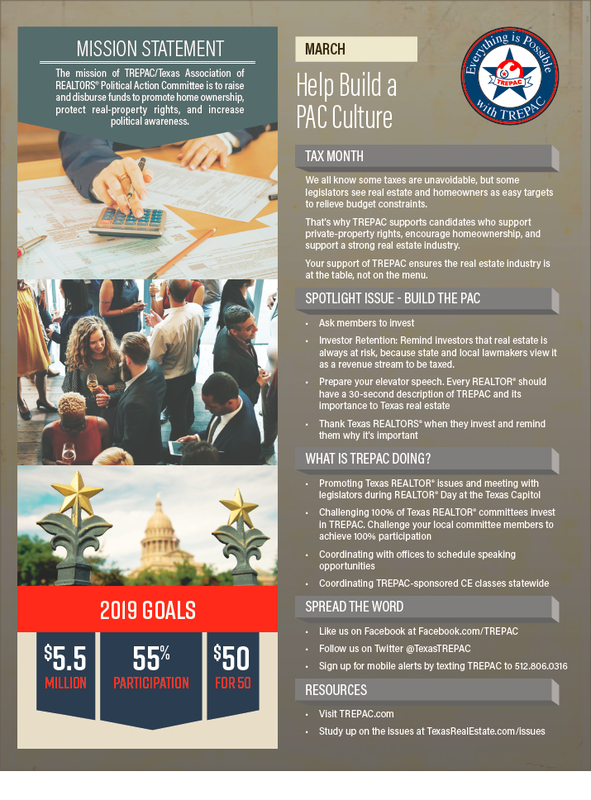 The 1st quarter of our TREPAC year has ended and it’s time to audit your fundraising efforts to ensure your members are being recognized appropriately! Visit the AE Dashboard to view 2019 pledge information along with your current fundraising progress. The AE Dashboard is a great tool specially designed to offer all the information AEs need to gather investment-level data and make 2019 an even better year! Texas Capitol visits, 8:30 a.m.-4 p.m.
Texas REALTORS® Open House, 8:30 a.m.-5 p.m.
Barbecue lunch at the Texas REALTORS® building, 11 a.m.-1 p.m.
Watch this video for highlights from the 2017 event. Contact your local association to participate. Major Investor Events: Don’t forget, now is the time to start planning your MI Events for 2019 if you haven’t already done so. Our goal is to reach 1,196 Major Investors this year, so we can continue to have the most number of MI’s from across the country. New Photos Available on Flickr! Click here to view and download your favorite TREPAC Photos!